Fifteen years into the new millennium, the London Welsh Male Voice Choir is well over a hundred years old, but the reasons for its continuing ability to entertain audiences worldwide are as valid as ever. From its early triumph in the 1912 Grand Final of the Paris International Tournament of Music to the Closing Ceremony of the London 2012 Olympic Games, the choir has managed to perform to a formula that is popular, but also ground-breaking and innovative at the same time. Its current success relies on an increasing number of comparatively young choristers who, over the last few years have brought vigour and freshness to the demands of the repertoire, keeping the older members on their musical toes, and an inspiring conductor, composer and musical director in Edward-Rhys Harry. He has managed to strike a balance between familiar songs, hymns and arias and new compositions that stretch the choir's range, testing its vocal limits at each weekly rehearsal, all done with an impish sense of humour. The choir's ability to rise to this challenge contrasts with the less reassuring picture of the health of male voice choirs in Wales. 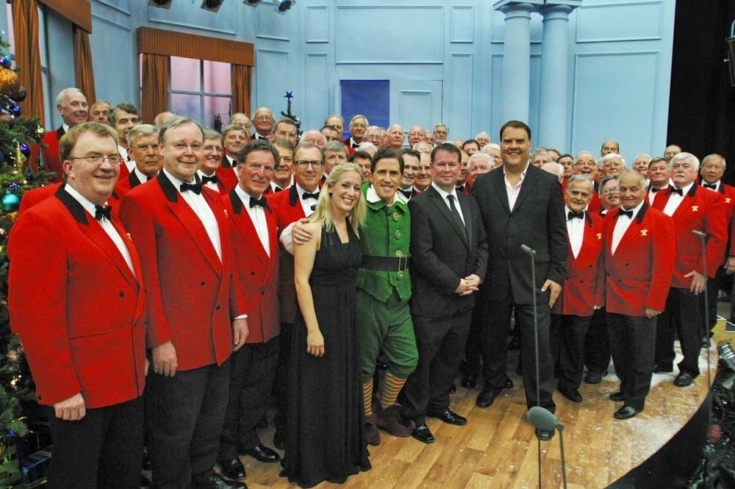 Apart from the recent success of a few exceptions like Only Men Aloud, Only Boys Aloud and the Froncysyllte Male Voice Choir, many choirs with illustrious histories have declined, ceased to exist or have amalgamated with other choirs. It may have something to do with the old adage of Goreu Cymro, Cymro Oddi Cartref (The best Welshman is he who is away from home), that the emotional tie to the land of our fathers is stronger when viewed from the standpoint of someone feeling 'hiraeth', the unique Welsh description of the emotion, an indescribable longing for people and places of our past. The emotions evoked in the songs that make up the choir's repertoire change from time to time. Only rarely in rehearsal will the poignancy of a line of poetry and a particular musical line combine to produce an unexpected reaction among choristers. In concert however, standing before a capacity audience and in a rewarding acoustic like one of the country's great cathedrals, the choir's concentration is total, and the sound produced is different. The same goes for this collection of songs. They may have been performed in studio in front of unforgiving microphones, but each chorister is aware that he is part of a long tradition of musical excellence, setting a benchmark that will be remembered with pride for decades to come. This album comprises new compositions, a new setting of The Lord's Prayer, familiar Welsh hymns, and songs from the musicals and from popular culture. One song, however, sums up a theme that runs through the choir's raison d'être. It is Gwinllan a Roddwyd i'm Gofal, and it compares Wales to a vineyard that has been handed down into our care by previous generations. The London Welsh Choir feels that it is part of that inherited culture, and its choristers are proud to hand over the fruits of this particular vineyard to the next generation, in good shape. Please explore our videos and gallery to experience the musical excellence we strive to achieve and maintain.